I purchased a Belkin 7-port USB Plus Hub about a month ago to go along with my Dell m1530 Laptop and it works perfectly. The USB 2.0 hub replicates USB ports for additional accessories. The hub is powered with an AC adapter as an additional energy source under the circumstances that you are using too many devices that require charging. As a bonus, since the hub has its own power supply, devices such as iPods, Zunes, ZENs, and other USB-powered gizmos can be recharged without having to leave your machine running. The only problem I ran into was the fact that it took up more desk space than an average hub due to the ports being arranged horizontally on the back. However Belkin makes up for it by adding a cable holder on the side to reduce clutter and by simply making a product that works flawlessly. The overall design of the Belkin Hub is simple and it works as advertised. There are five USB ports on the back along with the power cord and cable that connects to your computer. For easy access, the remaining 2 ports are located on top for use with flash drives. The hub is entirely stackable, so if you demand more ports you can place another Belkin 7-port or 4-port USB Plus Hub on top. You won’t lose access to the ports onto when stacking two 7-port hubs since the ports are still accessible through the hole. The hub also has discrete LED indicators embedded inside the encasement to display which ports are in use. 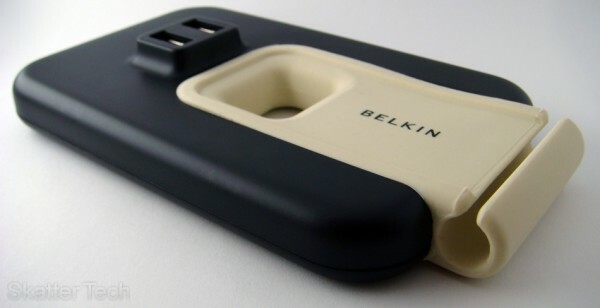 Although we didn’t test the hub with too many data transfer intensive devices such as external hard drives, but rather with small peripherals, Belkin claims a 480Mbps transfer rate. The hub is available in two color schemes: brown/white or white/blue. As seen in the pictures, I went with the brown/white configuration to match my other gizmos; however people who own Apple gizmos might want to go with the white/blue. So far the USB Plus Hub has been functioning perfectly, no hiccups what so ever. The only times the hub has slowed down is when we hit the USB 2.0 protocol transfer rate limit. The hub is well built and is available for a very reasonable price of $29.99 with no tax and free shipping from Amazon and other stores. But be aware that some stores such as Circuit City are charging as high as $50-60 for the same item, so shop around before buying. thanks for this. i got hub a few weeks ago and i didnt know about the power adapter stuff. the one i had doesnt have one so it doesnt work when all my gadgets are plugged in. im taking that back to frys tommorow and will probably get the one skatter reviewed . how does the white colored one look? I haven’t personally seen the white version, but I can tell you for sure that it looks very apple-ish!